It can be frustrating as a therapist and parent to have a child or client with sensory integration needs when therapy equipment resources are unavailable or too expensive for home or treatment spaces. It would be nice to refer a child to a fully equipped sensory integration gym but sometimes that is just not possible. Children with sensory needs may receive therapy only in the school setting or at home in early intervention and would benefit from overhead swivel swings, balance beams, and bolsters. There is a way around this expensive therapy equipment and it involves a trip to the local playground. 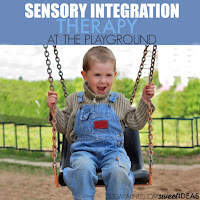 Try sensory integration therapy strategies at the playground. 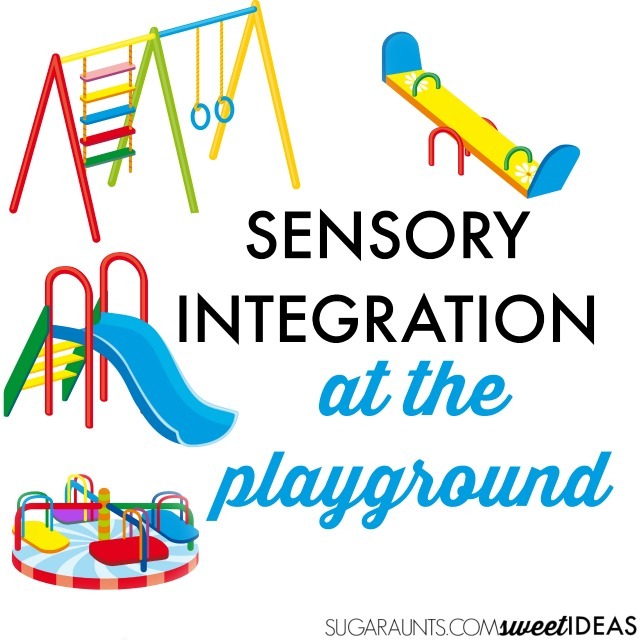 Kids will love the vestibular activities and other ways to challenge the sensory system in a fun way right on the playground. First, and most importantly, it is necessary to receive an assessment and therapist recommendations from an Occupational Therapist. Specific strategies meeting the individual's needs are needed for safety and appropriate intervention. Sensory integration therapy can be detrimental for the child with gravitational insecurity or the child who becomes overly responsive to vestibular input. Always consult an Occupational Therapist for individualized recommendations. The child's therapist can make appropriate recommendations while guiding the child rather than pushing interactions on playground equipment. Read more HERE about sensory systems and hyper- and hypo-responsiveness to sensory input. 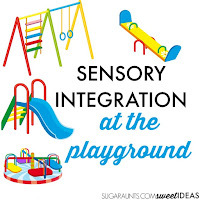 It is important to note that simply going to the playground to play is not effective sensory integration therapy. A typically developing child with appropriate sensory integration responses is provided with the sensory input he needs simply through the function of play. 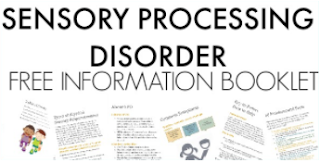 The child with sensory integration dysfunction has difficulty processing sensory input and can not respond to play in a way that is organizing and appropriate. The sensory information that a child with sensory processing disorder needs specific interventions to meet his needs (Ayres, 1979). Sensory integration processes information from our environment and our body in order to organize sensory input and allow us to respond appropriately. Sensory integration organizes information from our eyes, ears, joints, skin, mouth, nose, and our body's position in space. It allows our body to pull all of this information together to enable us to respond to sensory input in purposeful function. 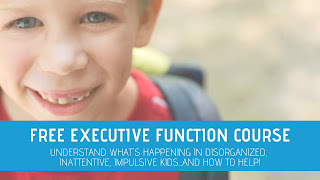 When there is a problem with sensory integration, the brain does not process or appropriately organize the sensory information in a way that provides allows for effective behavior. Without effective sensory integration, a person feels uncomfortable about himself and responds to ordinary environmental demands with stress (Ayres, 1979). In Sensory Integration Therapy, a therapist guides the child into activities that help the child organize sensory information and allow the child to perform adaptive responses. Therapy is a manner of helping the child to function with through activities that the child wants to do. 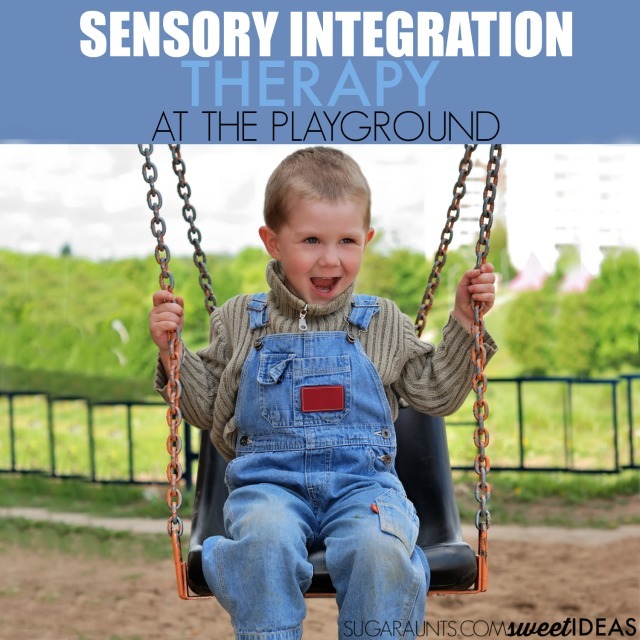 While sensory integration therapy involves many aspects that should be completed in various environments (such as vibration, deep pressure, joint compressions, brushing, as well as gustatory and olfactory sensory activities), there are SI therapy ideas that can be done at the playground that challenge or meet the needs of some children, depending on their specific needs. Swings- Full body movements can be developed through gravitational insecurity on the swings. Lying in a prone (superman) position on the swings is organizing in a forward/back motion on the swings. 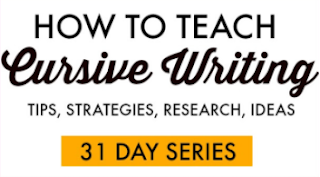 Slow swinging in the prone position helps to normalize a child with tactile defensiveness. Swings- Encourage the child to look up in front of them and even toss bean bags into a bucket. 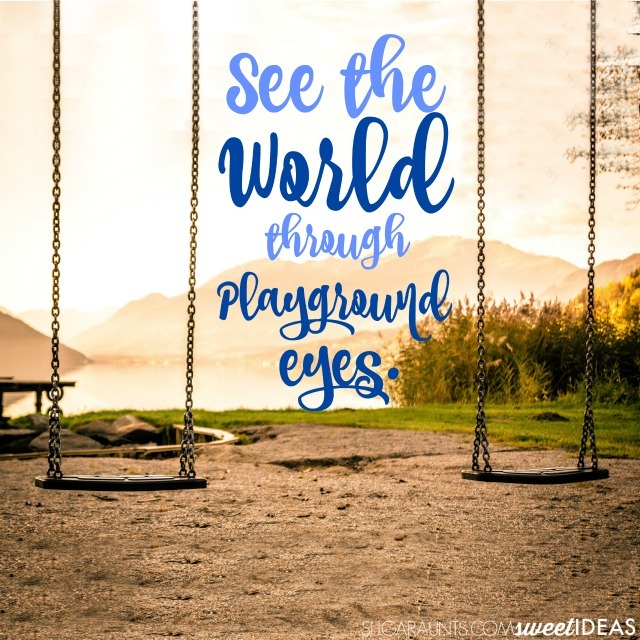 Ask the child to notice things around them in the playground area and play games like "I Spy" while slowly swinging back and forth in the prone position. Swings- Spinning on playground swings requires strength of the arms and upper body to maintain an upright position. The vestibular stimulation received from spinning is intense and shouldn't be utilized for more than 10 minutes. Swings- Position the child sideways in the swing so the swings are straddling the seat of the swing. Children can then be slowly pushed side to side as well as front-to-back. Slide- Riding down a slide promotes use of position in space as the child holds themselves up against the pull of gravity. Slide- Another idea for using the slide in sensory integration therapy is to have the child lay prone on the slide without movement. Use the upward ramp of the slide as a positioner for art creation or eye-hand coordination games like rolling a tennis ball up the slide and catching it as it rolls back down. Slide- Walking and crawling up the slides while looking upward is a test of gravity while encouraging bilateral coordination and core body strength. Tunnels- Encourage crawling and scooting through playground tunnels with eyes up and looking out of the tunnel so that the child's head and neck are resisting gravity and vision is guiding movement. Merry-go-round- Spinning on a merry-go-round can be done in a seated, prone, or supine position. Holding onto the bars and maintaining upright posture is a strengthening exercise and a source of proprioceptive input. Balance Beam- Balance beams can be used in obstacle courses and are a great source of vestibular and proprioceptive input while encouraging visual changes. Show the child how to look up forward as they walk along a balance beam. Steps- Many playground equipment sets have small sets of steps to reach different levels. Children can climb the steps, using the banister for support if needed. Try having the child pull themselves up the steps using the banister for a change in body and head position that promotes proprioceptive input, using the body's weight against gravity. Picnic Bench-Lying prone on the seat of the picnic bench while the hands are dropped to the ground is a way to work against gravity through the arms in a ball tossing game, or drawing in the dirt with a stick. Ask the child to scoot forward on the bench so that they need to work harder for efficiency of the vestibular system and against gravity. 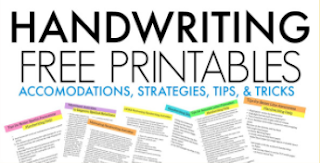 This type of activity promotes use of the eyes in an activity while the back, arms, head, and neck are used against gravity and help to build visual perception. Vertical Ladder- Climbing a ladder to monkey bars requires strength, bilateral coordination, and provides vestibular input. Using the child's own body weight is effective in providing proprioceptive input. Children can look up with neck extension to further adjust vestibular receptor response to movement in space. Ramps- Many playgrounds have ramps built in within the playground. Crawling, scooting, walking toe-to-toe, and sliding up and down these ramps provide many different sensory input opportunities. Try rolling a ball up or down these ramps into a target or to a friend. Other children may require vestibular sensory input in order to modulate excessive vestibular activity and will avoid equipment that provides a sense of gravitational insecurity. These children tend to avoid movement and changes in position. In these cases, children should be guided by an Occupational Therapist in treatment techniques that allow modulation of vestibular input. Vestibular sensory input can have a late-effect on children. They may not appear to respond to sensory input immediately, so children should be monitored and carefully watched for the effects of vestibular stimulation. Vestibular input (especially spinning) can evoke a powerful response in children and too much input can be overwhelming and disorganizing for children. These tools can be overpowering for children and the children should always be monitored for overreactions to sensory input. It is for this reason that sensory integration strategies at the playground should be initiated by an Occupational Therapist. The OT can train parents, teachers, or student aides in appropriate sensory strategies at the playground, all while making adaptations to the vestibular, proprioceptive, and tactile experiences. 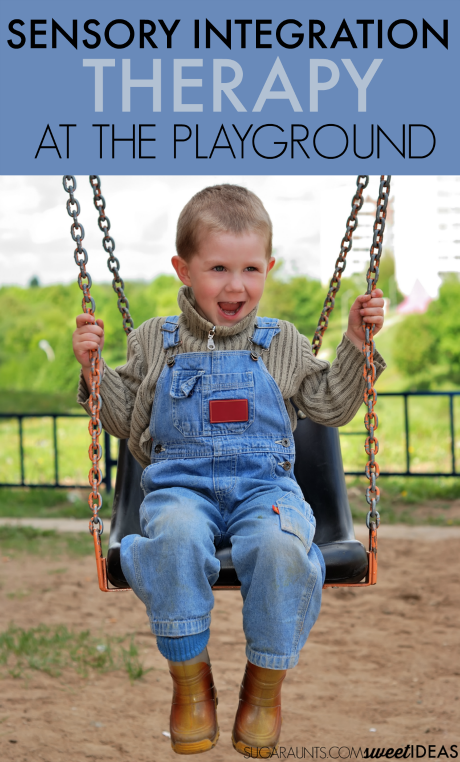 Continued play over and over again on playground equipment in manners that are designed to integrate the sensory systems can help the child with sensory processing disorders to respond appropriately through memories of motor plans. 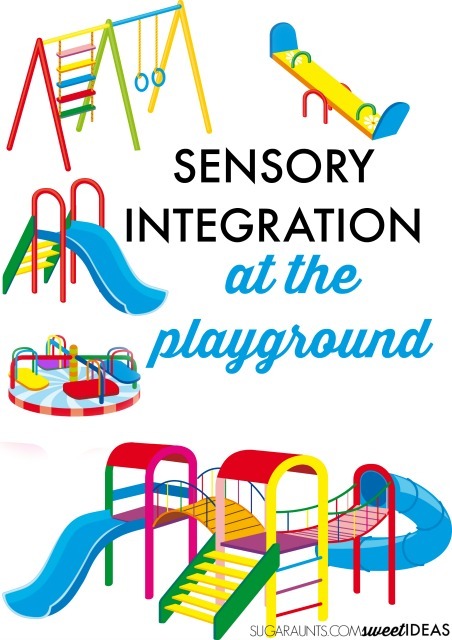 The sensory experiences at the playground can have a lasting impact on organization of sensory integration. The playground provides a wide variety of opportunities for movement through crawling, climbing, reaching, swinging, and sliding. The playground provides a fun environment for establishing confidence in the child's response to movement activities. 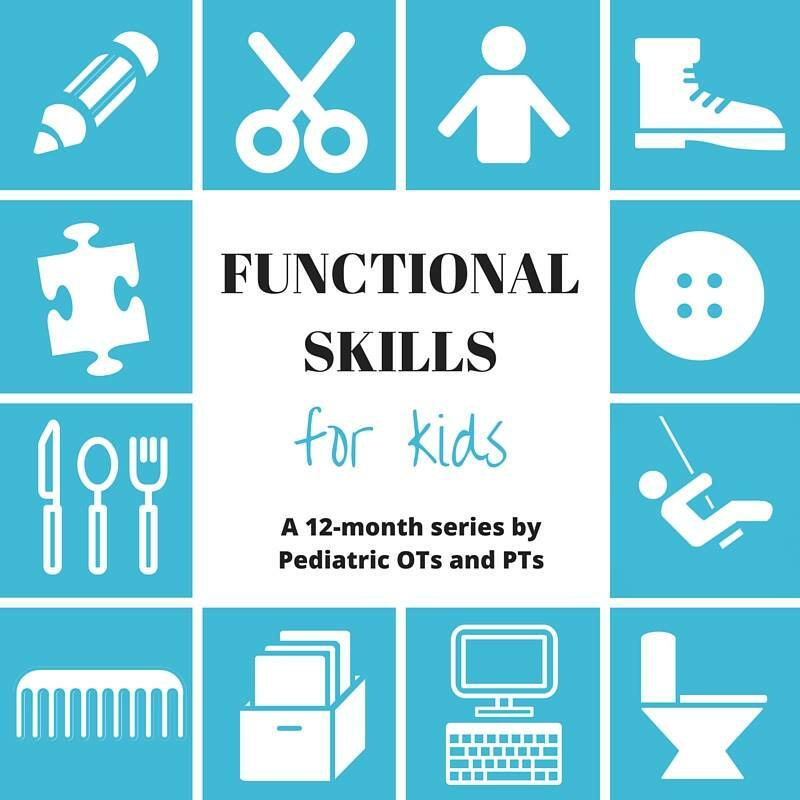 This post is part of the Functional Skills for Kids series that myself and nine other Occupational Therapist and Physical Therapists are completing. 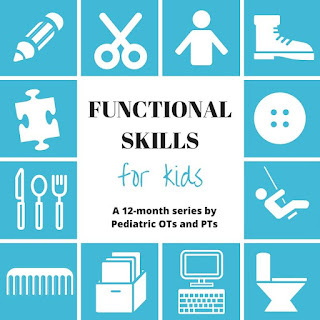 Each month, we are covering a different childhood function. You can see all of the past topics here. Ayres, A. J. (1979). Sensory integration and the child. Los Angeles: Western Psychological Services.